I hope they don't come after me. Quick, hide the paperwork! Congratulations to Nikki Sinclaire for working with the NOTW to expose the mass corruption in the EU. It comes as no surprise that so many MEPs are fiddling the system. Farage is reportedly spitting feathers over Nikki's latest excellent media exposure. This would have never have happened if Nikki had stayed in the EFD group. Farage would NEVER have allowed another UKIP MEP to get so much publicity. His fragile ego would NEVER allow another MEP to upstage him! She puts ALL of UKIP MEPs to shame. Where were they? Too busy living the good life at the EU's expense! SNEAKY British MEPs are claiming cash for a day's work in Brussels before scuttling to the Eurostar minutes later and travelling HOME. We caught Tory Robert Sturdy and Labour's Peter Skinner turning up at the Euro parliament at the crack of dawn to punch their card to grab £258 daily expenses. But our investigation found these grasping Euro MPs didn't stick around. And they're not alone. Hordes of foreign MEPs are at it too. This will outrage hard-working Brits who hand over £8.5BILLION a year to Europe - £137 per person - to pay for these pampered politicians. And it will be a huge embarrassment for Prime Minister David Cameron who in 2008 stepped in to clean up his party's expenses system in Brussels. He said at the time: "Just as I expect our MPs to adhere to the highest standards, so must MEPs. The taxpaying public have a right to know how their money is being spent and politicians have a duty to ensure it is spent properly." 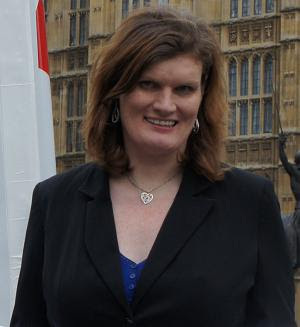 Disgusted West Midlands MEP Nikki Sinclaire agreed to expose her fellow Euro politicians - who earn £80,955 a year NOT including expenses. Of the 160 Euro MPs we filmed signing in before 10am, more than a third - 54 - arrived with overnight bags and suitcases. At least 25 left parliament shortly after. Ms Sinclaire, who runs campaigns from her website www.yourmep.org, said: "It's a disgrace. On a Friday, when parliament is virtually closed, MEPs still sign in for their £258 and then head straight for the exit doors. "Many people don't earn £258 a week, but some MEPs claim it for a day when they're in for barely an hour. Taxpayers should know how their cash is being spent." The pair arrived at Brussels Midi station together at 8.04am, jumping out of a chauffeur-driven people carrier in good time for the 8.29am Eurostar. Two hours later we caught them at London's St Pancras station. Another Polish MEP, Adam Gierek, 72, signed in at 8.01am with a colleague. We captured him stepping out of a chauffeur-driven car at the airport at 10:51am. Then Portuguese Euro MP Ilda Figueiredo 62, signed the register at 8:20am before being spotted at departures at 10:04am. We caught Polish Euro MP Danuta Jazlowiecka, 53, signing in at 9.21am, wheeling a suitcase. Then, at 9:42am - just 21 minutes later - she arrived at Strasbourg airport. There are only 134 days of official parliamentary business - which does NOT include Fridays - in a year, worth £34,538 in daily allowances. By also signing in on the 37 Fridays, each MEP can trouser £9,537 extra. Mr Sturdy said he worked late on Thursday night and that a power failure at King's Cross would have made getting home difficult. He added: "I'm signing in because I'm doing my job. As vice chair of international trade I have a lot on at the moment." He admitted he "often" signed in on Fridays. Mr Skinner said: "It is often the case I will work six days on the trot, some of which will be spent in the constituency. My first duty is to represent people across the South-East which is sometimes best done face-to-face"
Ms Jazlowiecka's aide told us: "It is not breaking rules to sign in and leave." And Ms Figueiredo's spokesman said it was up to parliament to determine what she could claim. UKIP: Where is the money? Is there no one in UKIP with a brain?